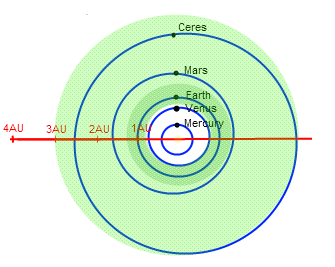 How well is Earth's orbit around the sun positioned within the boundaries of the habitable zone? The illustration by the Wikipedia image on the right would give that impression that Earth was comfortably positioned in the middle of this zone. What is the habitable zone? To be habitable, a planet the size of Earth should be within certain distances from its Sun, in order for liquid water to exist on its surface, for which temperatures must be between freezing point (0° C) and boiling point (100° C) of water. The distance between Earth and the Sun is one astronomical unit (1 AU). Mars is often said to have an average distance from the Sun of 1.52 AU. A recent study led by Ravi Kopparapu at Penn State mentions that early Mars was warm enough for liquid water to flow on its surface. However, the present-day solar flux at Mars distance is 0.43 times that of Earth. Therefore, the solar flux received by Mars at 3.8 Gyr was 0.75 × 0.43 = 0.32 times that of Earth. 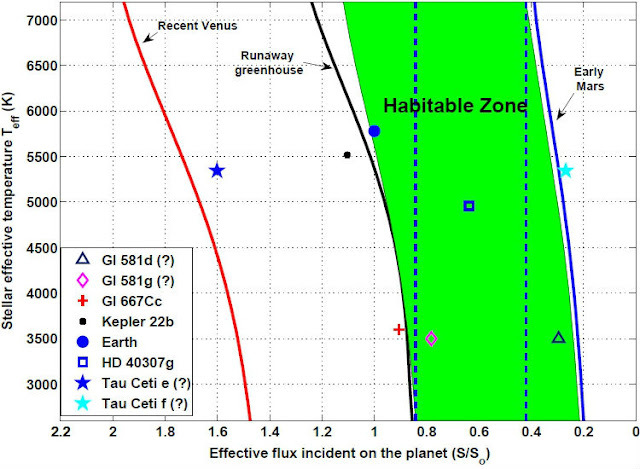 The corresponding outer habitable zone limit today, then, would be about 1.77 AU, i.e. just a bit too far away from the Sun to sustain water in liquid form. Venus, on the other hand, is too close to the Sun (see box below). Kopparapu argues that once the atmosphere makes the transition to a moist greenhouse, the only option would be global geoengineering to reverse the process. In such a moist-greenhouse scenario, not only are the ozone layer and ice caps destroyed, but the oceans would begin evaporating into the atmosphere's upper stratosphere. Venus was transformed from a haven for water to a fiery hell by an runaway greenhouse effect, concludes the European Space Agency (ESA), after studying data from the Venus Express, which has been orbiting Venus since April 2006. How could a world so similar to Earth have turned into such a noxious and inhospitable place? The answer is planetary warming. At some point, atmospheric carbon triggered a runaway warming on Venus that boiled away the oceans. As water vapour is a greenhouse gas, this further trapped solar heat, causing the planet to heat up even more. So, more surface water evaporated, and eventually dissipated into space. It was a “positive feedback” -- a vicious circle of self-reinforcing warming which slowly dessicated the planet. “Eventually the oceans began to boil”, said David Grinspoon, a Venus Express interdisciplinary scientist from the Denver Museum of Nature and Science, Colorado, USA. “You wound up with what we call a runaway greenhouse effect”, Hakan Svedhem says. Venus Express found hydrogen and oxygen ions escaping in a two to one ratio, meaning that water vapor in the atmosphere the little that is left of what they believe were once oceans is still disappearing. While most of Earth's carbon store remained locked up in the soil, rocks and oceans, on Venus it went into the atmosphere, resulting in Venus' atmosphere now consisting of about 95% carbon dioxide. The abstract says there is no clear difference between runaway and limit of habitable zone below approximately 5,000 Kelvin effective temperature for K and M planets.. But Earth, type M, had to be below this when life first started and there was liquid water at least till the time life created the Oxygen rich atmosphere..
Then a gap began to appear as the sun matured and enlarged and heated up while life became mature too. But we have thrown a wrench in the system and touched off a huge problem. Carbonate balance destabilization by the swamping of atmosphere with Carbon Dioxide from fossil fuel use. Swamping that also causing temperature forcing upward which is now decaying water ice form which holds methane.. Vast amounts of methane rising into an inversion area where it is stable at approximately 30 to 47 kilometers altitude. Methane primarily from decay of Arctic methane hydrate in sea floor..
Time is short to reverse this if there time at all to say the least. -yet Assad bombs his people and eyes are on finance. Korea looks set to war. What are people thinking? Earth is ready to snap to extinction line outside of habitable zone now. So, what I don't understand is this: Why would this present episode of warming push the system toward moist greenhouse? Why now? What is different? In the past, methane has been released gradually, over many years, whereas the danger now is that huge amounts of methane will soon be released within a short time-span, driving up temperatures beyond a tipping point where the combined effect of carbon dioxide, methane, nitrous oxide, ozone, water vapor, etc. will make the atmosphere very humid and warm, with water continuously evaporating from oceans, while hydrogen and oxygen is lost into space, until all water is gone, as happened in the case of Venus. How would Methane in a localized area, despite the content of the methane upon release, cause such a substantial rise in temperatures? Would it not take time for the Methane to effect the planet in it's entirety? Methane has a huge warming potency and there are huge amounts of methane present in sediments below the Arctic Ocean. Back in 2008, Shakhova et al. considered release of up to 50 Gt of predicted amount of hydrate storage as highly possible for abrupt release at any time; by comparison, the total amount of methane currently in the atmosphere is about 5 Gt, as discussed at methane hydrates. Yes, it will take some time for runaway warming to spread globally, as discussed at this post; as I said above, it's not just methane; as temperatures rise, there's the combined effect of methane, soot, carbon dioxide, nitrous oxide, ozone, water vapor, etc. This threatens to keep pushing temperatures up to levels at which water will evaporate from oceans, while hydrogen and oxygen is lost into space, until all water is gone. "Solar System’s habitable zone lies between 0.99 AU (92 million mi, 148 million km) and 1.70 AU (158 million mi, 254 million km) from the Sun. "Mars has an average distance from the Sun of 1.52 AU, i.e. too cold to sustain water in liquid form." 1.52 < 1.70, yet, Mars isn't in the habitable zone. Thanks for pointing this out. It's actually not an error, but it's indeed confusing without further explanation, so I've added some text from Kopparapu's paper. Thank you Sam...most helpful since my specialty is more at the molecular scale than the planetary one. "Kopparapu says that if current IPCC temperature projections of a 4 K increase"
Shouldn't it read "of a 4 C increase"? Kelvin (K) is often used as a unit for temperature in astronomy, since zero degrees Kelvin is the absolute minimum, which is −273.15 degrees Celsius. Increments in Kelvin equal increments in Celsius, so for the purpose of this post the four degrees Kelvin equals four degrees Celsius. Yes, Martin, recent warming is the result of emissions caused by people; the realization that Earth is on the edge of the habitable zone is new and this adds to the need for comprehensive and effective action, such as described at the Climate Plan blog. I might add for those reading the article above and not aware of the assumption in the text which is that the output from the sun rises about 1% per 100 million years approximately. This means that since Life began on Earth that the output of solar radiation hitting the planet has increased by somewhere between 25% and 35%. Therefore this means that the habitable zone has moving outwards at a similar rate. It has been argued elsewhere that if not for the low levels of CO2 (pre-industrial) and the ice caps at both poles then things would be getting very tricky for life because as the habitable zone moves outward for a given atmosphere setup we are moving closer to the hot-side of the inhabitable zone hence reducing carbon and reflecting lots of light has bought time. And the point of the article is that we haven blown away these protective mechanisms and are essentially leaping straight into the unrecoverable too hot and life destroying zone.